It's the very latest from the man who knows just a bit too much about tech - T3's Gadget Guru! How can I pass the tech-love bug onto my kids? GaGu's children – Hercules, Alta Vista, Mairée Dolphin and Mimsy Frou-Frou – are all grown up now, and get in touch only to demand money. His grandkids, if anything, are even more demanding ﬁ nancially, so maybe you'd be better off keeping them away from tech, and convincing them that a stick and a cardboard box are the greatest toys a boy or girl can have? If you really must ﬁnd gateway drugs to take them towards full tech addiction, your friendly, playground-based pusher is Minecraft. GaGu is going to stop with this drug-dealing metaphor now; it seems inappropriate. Minecraft is the online equivalent of LEGO. Actually, it's the ofﬂine equivalent too, thanks to a spin-off with the Scandiwegian brick-o-stick-o marque. It teaches kiddies about building amazing things, and also introduces them to computer games, problem solving and online interaction. Now, if there's one thing today's kids love even more than Minecraft, it's watching YouTube videos about Minecraft. Even if, to adults, said videos are slightly more irritating than someone chewing gum noisily while scraping their ﬁ ngernails down a blackboard, whilst dressed as a clown. So why not get junior creating 'content' rather than just consuming it? 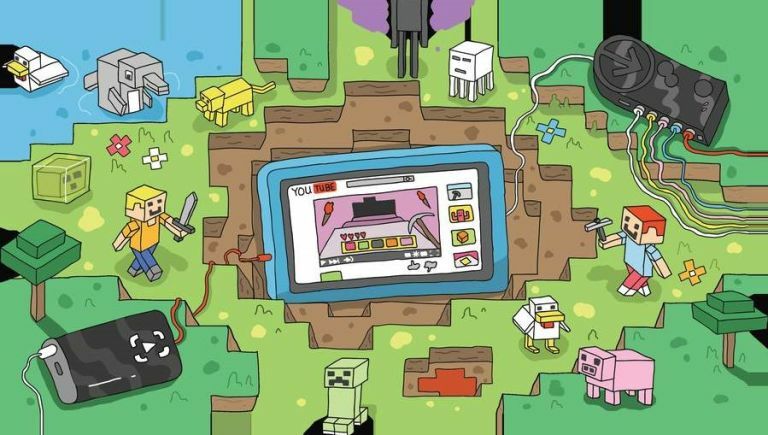 Venture into Maplins and get a Game Capture HD device from Roxio (£59) or Elgato (£99) and your offspring can make their own Minecraft videos, showcasing their ability to create magical landscapes, solve problems via team work, and totally overuse the word 'awesome' in a loud voice. GaGu's other kiddy fave is Amazon's Fire 7 Kids Edition tablet. This can be set up to be safely used by kids from three and up, with new features unlockable when you feel they are ready for them, and strict limits on when it can be used and for how long. A two-year, no-quibble guarantee gives peace of mind, should they ﬁnd a way to break this robust bit of kit. I need a new kettle and toaster. What do you recommend for cooked water and hot bread? What's the best tech anorak, GaGu? The modern winter jacket is like the Chelsea Tractor of clothing. Does Guru really need a coat designed for a jaunt up Everest to go to Waitrose on a mildly parky morning? Probably not… But he's damn well going to anyway. Probably the most versatile mix of lightness and cold protection is given by down jackets, plus the puffy look is bang on trend right now. So you could try something like the Rab Electron (£200). This has a water-resistant coating, but the goose down inside has also been treated to repel moisture, reducing the risk of your jacket turning into a sodden and freezing mix of clumped together feathers. A cheaper yet similarly treated alternative is the cheaper (£100) North Ridge Hybrid, which comes in a fetching blend of “tango” (orange) and “brick” (browny orange). GaGu's fave is Mountain Hardware's Ghost Whisperer (£220), which gives ample insulation despite weighing about 220g, and is able to pack away so small it can be stored up his nose. Guru's physique, despite his advancing years, is oft compared to that of board-diver Tom Daley. Hence he likes the demanding base layers of X-Bionic (costing anything up to £130) and Aclima (from £30). The former in particular are crazily bodily hugging and technical, with excellent water repellence, wicking of sweat and cooling in areas such as the armpits or bum crack, but with greater heat retention in areas that need it. If you just want extra warmth on a light jog, or when watching Jeremy Kyle while waiting for the boiler repair man, GaGu suggests you drop £10-£20 on the considerably more forgiving but still excellent likes of Craghoppers or Helly Hansen. Toasty. Can I upgrade my PS4 drive? Yes! And it's easy, so long as you get the right drive: a 2.5-inch SATA that is no more than 9.5mm tall. Back up your data to a USB key via Settings/Application saved data/Saved data in system storage. You won't be able to back up game installs, just saves. Unplug your PS4, then slide off the top cover and remove the hard drive with a Philips screwdriver, replacing it with your new one. Download the PS4 system software, plonk it on a USB key in a folder called Update, inside a further folder called PS4, and plug it in to your console. Power up, holding down the power button until instructions appear on screen. Follow them carefully. What's a good pair of in-ear headphones for running? When doing his daily 10K, GaGu favours two pairs at the moment. For sheer ear-ﬁlling, complete world-outside-blocking unshakeability, it has to be Monster's Adidas Sport Response (wired) or iSport Wireless Superslim from the same brand. The Sport Response are arguably the best bet as they're only 40 quid, or £60 if you want the version that comes with a mic for calls and music controls. Their sound is rather, erm, unsubtle, mind. If you want something a bit more musical, try Gibson's Trainer in-ears. These aren't so ﬁrmly rooted in your lugs, but they're still secure enough.